With general elections expected before May, corruption scandals over high-profile defense deals, and a deflated rupee, Defense Minister A.K. Antony, who has cultivated an image of integrity, has taken a go-slow approach on vitally needed equipment projects. The slowdown has taken hold as India is expected to spend approximately $100 billion on military modernization in the next 10 years, to boost its military capability as a hedge against neighboring rivals China and Pakistan (see pages 73-76). Defense officials are grumbling about the pace of upgrades given the gap between the country's security goals and its force strength. “The minister's obsessive quest for an unblemished procurement process has delayed several programs, mainly the acquisition of fighter aircraft,” says a senior Indian defense official, adding that the country has underinvested in all kinds of military equipment over the last three decades. The Indian air force, which receives more modernization funding than the other military services, has experienced some of the most severe contracting delays. 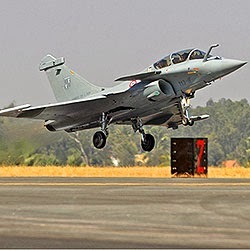 That includes the contract to buy 126 Medium Multi-Role Combat Aircraft (MMRCA) Rafales from Dassault, which won the competition in January 2012. The delay could extend until the end of this year and has forced the air force to extend the operational life of aging aircraft through continued upgrades. In part because of the falling Indian rupee, the cost of the deal is expected to soar to $25 billion. The request for proposals had estimated the program cost at $10.6 billion, or $82.3 million per fighter. A $3 billion proposal to acquire 56 transport aircraft to replace the air force's antiquated HS-748, or Avro, transport aircraft and the operational clearance for the indigenously produced Light Combat Aircraft (LCA) Tejas also have been delayed. After cancellation of the AW101 helicopter deal due to a procurement scandal, the government also put on hold the proposed acquisition of 197 light utility helicopters (LUH) to replace the vintage Cheetah/Chetak fleets. The air force is technically supposed to have 42 fighter squadrons but has only 34, each consisting of 20 aircraft. Six squadrons use aging MiG-21 fighters. “All MiG-21 and MiG-27 aircraft will be phased out by 2018-20, leaving 26 squadrons consisting of six Jaguars, three MiG-29s, three Mirage 200s and 14 Sukhoi Su-30s,” writes army Lt. Gen. (ret.) Ashok Mehta in The Pioneer newspaper. “With LCA Tejas Mark-I awaiting final operational clearance, the advance Tejas with upgraded GE 414 engines can materialize by the end of the decade. Under this phase-out plan, any delay, or heaven forbid, cancellation of the MMRCA contract by the new government will leave the Indian air force in operational lurch. “If the MMRCA contract is signed in 2015, the first of 18 aircraft will be delivered after 32 months in 2018 and the last of the remaining 108 aircraft, to be made in India, will become operational in 2025,” Mehta writes. The air force's desired combat strength based on a two-front war would require around 50 squadrons. Before retiring on Dec. 31, former Indian air force chief Norman Browne warned that India cannot afford to delay the MMRCA deal beyond this year. If the MMRCA does not arrive by March 2017, force levels will rapidly decrease, he said. Despite procurement delays, the defense ministry has completed some deals, including for 12 P-8I long-range maritime patrol aircraft and an additional 10 C-17 heavy-lift and 12 C-130J transport aircraft. It has also developed the Tejas, upgraded 51 Mirage 2000 combat aircraft and decided to buy 42 Sukhoi Su-30 MK1 fighters from Russia, which will be assembled in India. Other important deals close to the finish line include the acquisition of 22 Apache attack helicopters, worth around $1.4 billion, and 15 Chinook heavy-lift helicopters at an estimated cost of around $1 billion. These deals must be signed in the next financial year, beginning April 1. In addition to aircraft, India's shopping list includes howitzers, anti-tank missiles, infantry combat vehicles, assault rifles and submarines. The army is facing “large-scale voids” in critical weaponry and ammunition and has been equally handicapped with very poor anti-tank capability and a 50% deficiency in anti-tank guided missiles. The defense ministry has signed 17 contracts for the army in the current fiscal year. However, army chief Gen. Bikram Singh says another 23 contracts, worth around 120 billion rupees ($1.9 billion) remain in the pipeline. “We are hopeful they will be inked before March 31. It's an upward trend, a healthy trend,” he says. The Indian navy is also suffering: Its 30-year plan to induct 24 new submarines was approved in 1999, but no new vessels have entered service yet.